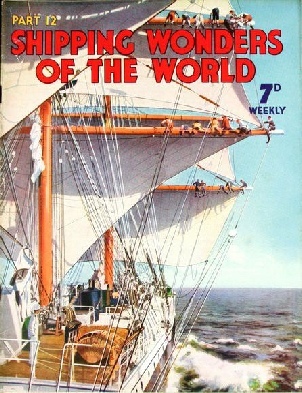 Part 12 of Shipping Wonders of the World was published on Tuesday 28th April 1936. This issue included a colour plate illustrating the distinctions of rank in the Royal Navy, which accompanied an article In the Royal Navy. The coloured plate was attached to page 380 of this issue. The cover of the present part shows men working aloft in the Swedish four-masted barque Abraham Rydberg. Built at Glasgow in 1892 by C. Connell & Co, her registered tonnage is 2,345 gross. She was originally called Hawaiian Isles, and this was changed to Star of Greenland before she was renamed Abraham Rydberg. The vessel is fitted as a first-class training ship, and is now engaged in the Australian grain trade. Beautiful and rare pearls have long been a magnet to adventurers, beckoning them on to deeds of endurance and courage. One of the most hazardous occupations known, pearl-diving is still carried on in some parts of the world as in early times. Modern methods have been applied extensively; but good pearls are still rare, despite the world-wide activities of the pearling fleets. The article is by Sidney Howard. NORTH OF AUSTRALIA (left). North of Australia there are extensive pearl fisheries in the area between Broome (Western Australia) and Thursday Island. Thursday Island lies to the north-west of Cape York, which is the most northerly point of Queensland. Besides the Australian aborigines, there are Malayans, Chinese, Japanese and natives from Timor engaged in these pearl fisheries. Rapid progress was made in the development of steam propulsion in the first half of the nineteenth century, and many features of great importance to-day were then introduced. This chapter is by F E Dean and is the second article in the series Marine Engines and Their Story. Constantly risking death and injury, courageous men continued to search for and to retrieve bullion from the shattered hull of the sunken White Star Liner Laurentic. The divers who reached the wreck found it in a difficult position, but by constantly risking their lives they retrieved the bullion under difficulties that seemed at times to be insuperable. You can read more about this salvage in chapter VI of David Masters’ book The Wonders of Salvage. The article is by David Masters and is the fourth in the series Dramas of Salvage. The article concludes in part 13. This is the seventh article in the series on Merchant Ship Types. The career of the clipper Dreadnought is a stirring chronicle of romance and recklessness on the Atlantic. The clipper may be regarded as representing the high-water mark of Atlantic sailing vessels. 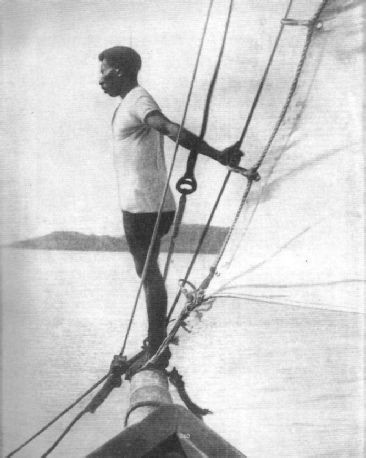 Commanded by the famous Samuel Samuels, she had the reputation of never having been passed by a sailing ship in more than a four-knots breeze. Her story is one of the finest in the series Speed Under Sail. The article was written by Frank Bowen. Before a youth may enter the Royal Navy he must pass through the long period of training and discipline necessary for those who would serve under the White Ensign. This chapter tells of the many opportunities available and is illustrated by a magnificent colour-plate. The article is by Frank Bowen and is the second in the series Going to Sea. 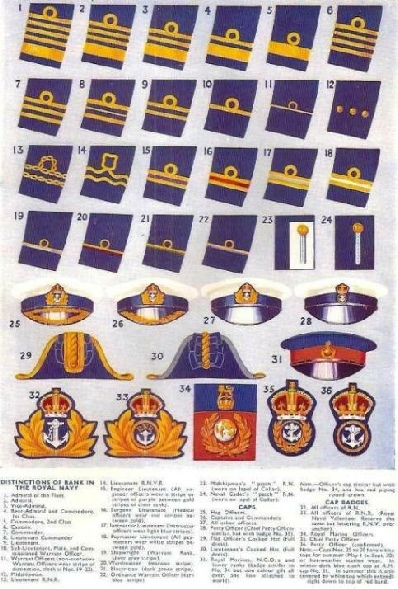 The colour plate (left) shows the distinctions of rank in the Royal Navy ranging from Admiral of the Fleet to Naval Cadet’s “patch”. It also includes illustrations of Caps and Cap Badges.